There are two types of Shone’s syndrome: complete and incomplete Shone’s syndrome. In the complete form of Shone’s syndrome, all four of the lesions will be present. Valvular Mitral Valve stenosis due to a parachute mitral valve: The mitral valve chordae insert into one papillary muscle. 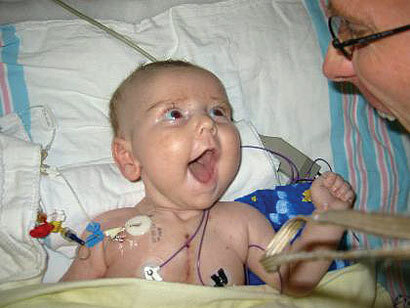 In parachute-like asymmetric mitral valve, most or all chordal attachments are to one papillary muscl. This abnormal attachment of the chordae tendonae results in stenosis of the mitral valve since the valves are held in close proximity. Subaortic stenosis (membranous or muscular): is a fixed form of anatomic obstruction to outlet of blood across the left ventricular outflow tract. 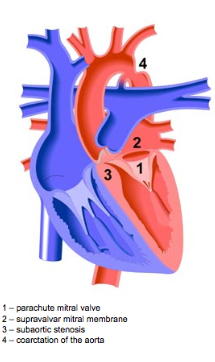 There are four basic anatomic variants which are as follows: (1) a thin discrete membrane consisting of endocardial fold and fibrous tissue, (2) a fibromuscular ridge consisting of a thickened membrane with a muscular base at the crest of the interventricular septum, (3) a diffuse, fibromuscular, tunnel-like narrowing of the LVOT, and (4) accessory or anomalous mitral valve tissue. Heart failure, pulmonary hypertension, pulmonary edema, right ventricular hypertrophy, Left ventricular hypoplasia, pneumonia and cor pulmonale. If detected early surgery can be performed to correct the defects and is typically done in stages, which reduce dysfunctions. The longer the patient goes untreated and the more elevated pulmonary artery pressure increases the more worse the outcome. Iwata Y, Imai Y, Shin’oka T, Kurosawa H. Subaortic stenosis associated with systolic anterior motion. Heart Vessels. Nov 2008;23(6):436-9. Morris et al, CT and MR Imaging of the Mitral Valve: Radiologic-Pathologic Correlation, RadioGraphics, October 2010; 30, 1603-1620. Bonow RO, Carabello BA, Chatterjee K, et al. 2008 Focused update incorporated into the ACC/AHA 2006 guidelines for the management of patients with valvular heart disease: a report of the American College of Cardiology/American Heart Association Task Force on Practice Guidelines Circulation 2008;118:e523-e661. Board, A.D.A.M. Editorial. Coarctation of the Aorta. U.S. National Library of Medicine, 18 Jan. 0001. Web. 08 Mar. 2013.